One of the convicts in the Rajiv Gandhi assassination case, Robert Payas, a Sri Lankan national, on Wednesday petitioned the Tamil Nadu government seeking mercy killing. In an emotionally charged letter to Chief Minister K Palaniswami, he said he should be killed on grounds of mercy and his body should be handed over to his family. "Payas has petitioned the government through the Puzhal prison authorities," a top prison official said. Blaming the Centre -- both the previous United Progressive Alliance government and the incumbent National Democratic Alliance -- for opposing the release of seven Rajiv Gandhi case convicts, including him, when former Chief Minister Jayalalithaa took the initiative, he said, "We do not know why our release has been put on hold." He said Jayalalitaa's decision to release the convicts was reflective of the aspiration of Tamils not only in Tamil Nadu, but across the world, to see them free. He said the Centre has 'decided that our lives must end in prison'. Stressing that the 'silence of the governments (including Tamil Nadu) only tell us this (that their lives should end in jail)', he said he understood that the intention of the state and Centre was to confine them in prison. "I have come to the conclusion that there is no use living when there is no scope for release," he said, adding that the very long prison sentence has punished not only him, but also his family. On 11 June this year, he completed 26 years of incarceration and entered the 27th year, he said. The thought of seeking euthanasia has now become deeply entrenched, an idea which did not surface in the past, he said. "Also, for the past many years since none of my family members or relatives have visited me I do not think that there is any meaning in my life." Claiming that Supreme Court Judge Justice Wadhwa had held him to be 'not guilty', in 1999, he said still he continued to serve the prison sentence and it greatly anguished him. When Pranab and Rajiv Gandhi snuck into a bathroom! View: Rajiv Gandhi's killers deserve to die. Hang them! 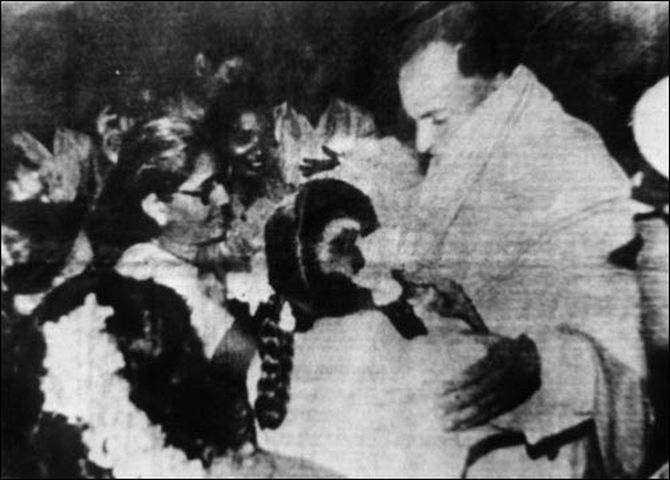 What would Rajiv Gandhi look like today?